Mohegan Sun’s Rising Stars Boxing Series presented by Main Events completed its third successful installment tonight at the Arena at Mohegan Sun. In the main event, Rising Stars’ middleweight prospect Vaughn Alexander dazzled fans with a heart-stopping battle against local fan-favorite Elvin Ayala. The bout started slow with both competitors feeling each other out. In the fifth round, Alexander began to turn on the heat. In the seventh, Alexander refused to let a bloody broken nose slow him down. He ignored the hometown cheers for Ayala and sent Ayala to the canvas in brutal fashion. The referee stopped the contest at 1:42 of round seven. The New Haven Grudge match between Nate Green (10-0, 2 KOs) and Josh Crespo (6-6-3, 3 KOs) did not disappoint the fans who came to see a heated crosstown rivalry. Crespo had been gunning for a rematch with Green since they met in Green’s professional debut in 2011. Crespo drew first blood, cutting Green between the eyes in the second round. Green countered the next round with a knockdown. The referee also deducted a point for an illegal punch from Crespo in the third. The doctor stopped the fight due to an accidental headbutt after the bell to the end the fourth round, sending it to the cards. The judges all scored the bout 40-35 in favor of Nate Green. 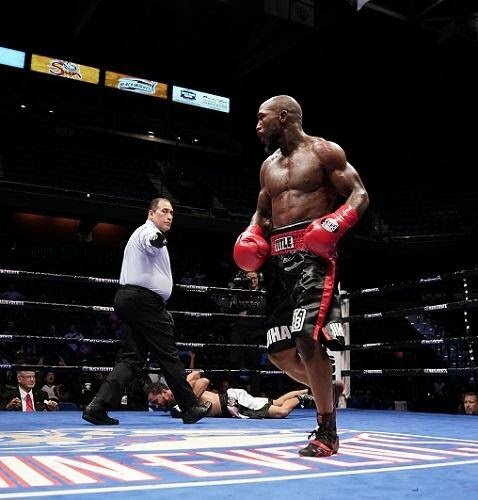 New London, Connecticut-based heavyweight sensation Cassius Chaney (11-0, 5 KOs) overcame adversity for the first time in his young career. He got up from a first round knockdown against Jon Bolden (8-12-1, 6 KOs) of Brooklyn, New York to go the distance and secure a come-from-behind unanimous decision victory. At the end of this action-packed brawl, which left Cassius with a cut over his left eye, all three judges scored the bout 56-55 in favor Chaney. The featherweight battle between North Bergen, New Jersey’s fan-favorite Kevin Asmat (3-1, 2 KOs) and Bronx, New York native Rafael Castillo Rosendo (0-1) was entertaining from bell to bell. The two traded nasty shots for the full four rounds of their bout. All three judges scored the contest 39-37 in favor of Kevin Asmat. Welterweights Enriko Gogokhia (6-0, 3 KOs) of Oxnard, California and Joquin De La Rosa (6-3-1, 3 KOs) of Victoria, Mexico were scheduled for a six round bout, but Gogokhia made quick work of De La Rosa. After a knockdown in the second, Enriko unleashed a fury of punches on his opponent and the referee quickly stopped the fight at 1:27 of round two. Shirley, New York native LeShawn Rodriguez (7-0, 6 KOs) scored an early knockout over Romon Barber (7-16, 6 KOs) of Wichita, Kansas. The referee waved off Barber after a knock down at 1:15 of the third round. In the first bout of the evening Bakhram Murtazaliev (10-0, 8 KOs) of Grozny, Russia made quick work of Robson De Assis (14-5, 8 KOs) of Sao Paulo, Brazil. After two quick knockdowns in the first, the referee called a halt to the action at 1:14 of the first round.